Trailhead and parking area are at The Basin, off Rt. 93 in Lincoln, NH. The Basin exit is 2.1 miles north of exit 34A and 3.4 miles south of Exit 34B. Parking is available on both sides of the highway, but is most convenient (and the trail directions are described from) the west (southbound) side. If traveling north, you can reverse direction at exit 34B. The Basin is one of Franconia Notch State Park's most popular tourist attractions. On a summer weekend, swarms of visitors walk its paved paths to see the circular bowl and curved waterfall on the Pemigewasset River known as The Basin. Plenty of other exciting water features await around it. Hikers have the opportunity to venture beyond the paved walkways and follow the delightful Cascade Brook to Rocky Glen Falls. From the parking area, walk down the paved walkways into the Basin. Cross the bridge over the river, passing a powerful cascade. Follow the path past a beautiful aqua-tinted pool with a sand beach and along the river, by more cascades and smoothed rock waterways. Continue down to the main attraction, The Basin, an amazing curved waterfall through carved rock into a huge, swirling pool underneath a half-domed rock ceiling. Just past The Basin, cross a bridge and bear right off the paved path onto Basin-Cascades Trail. Pass Pemi Trail on the right and continue at easy grades through the woods, heading toward Cascade Brook. 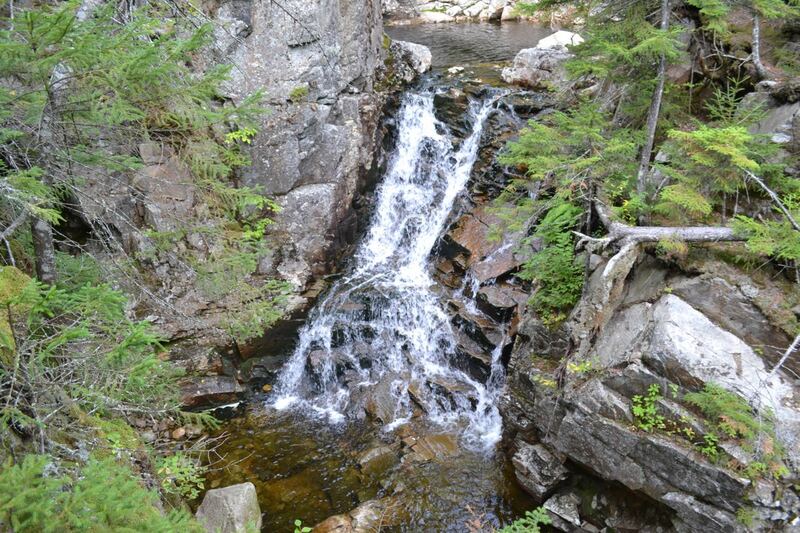 The trail quickly reaches the brook and follows it closely, passing many beautiful sets of cascades, where there are opportunities to walk out onto the rocky brook bed and explore. One notable unnamed waterfall spans the width of the brook as it tumbles and slides into a huge pool. Not far past this, 0.4 miles from the paths in the Basin, a spur on the left descends to Kinsman Falls, a straight, narrow plunge over a small cliff. The trail then passes by the top of the waterfall. In 0.1 miles, the trail crosses the brook on medium-sized rocks and climbs a steep pitch on the other side. It continues to follow the brook closely, passing a few more exciting cascades before the trail (and the brook) levels somewhat. Eventually, the brook takes a sharp turn and the trail climbs steeply. It continues uphill to a viewpoint overlooking Rocky Glen Falls (just off the trail), whose name suits it well. Just past this, turn right and step down into a gorge to get a closer look at the waterfall. The brook is walled in above and below this picturesque waterfall. This is 0.4 miles from the brook crossing. For a longer and even more scenic hike, continue to Lonesome Lake.